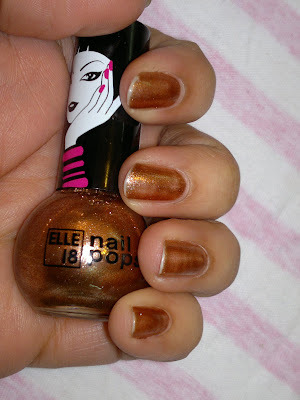 Today I will be sharing with you guys my Nail paint of the week, which is Elle 18 Nail Pops in 05. Let's see how it fares in my opinion. I got this online for INR 50 for 5 ml of the product. The packaging is very basic but functional. The bottle is super duper small and cute, round bottle. Can be easily carried in your clutch for ready touch ups. Nail brush is nothing fancy. Just your regular thin brush for coating your nails. Now coming to the product and shade. Elle 18 has given numbers instead on names to the nail paints. I chose this shade as I found this to be easily wearable shade, with which you cannot go wrong. I would describe the shade as shimmery bronze. Some people may find it too shimmery for their liking, but I find it okay for wearing daily to office. Adds a bit of bling to the current grey wintery days!!! Also, the shimmer doesn't feel gritty once the nail paint has dried off. 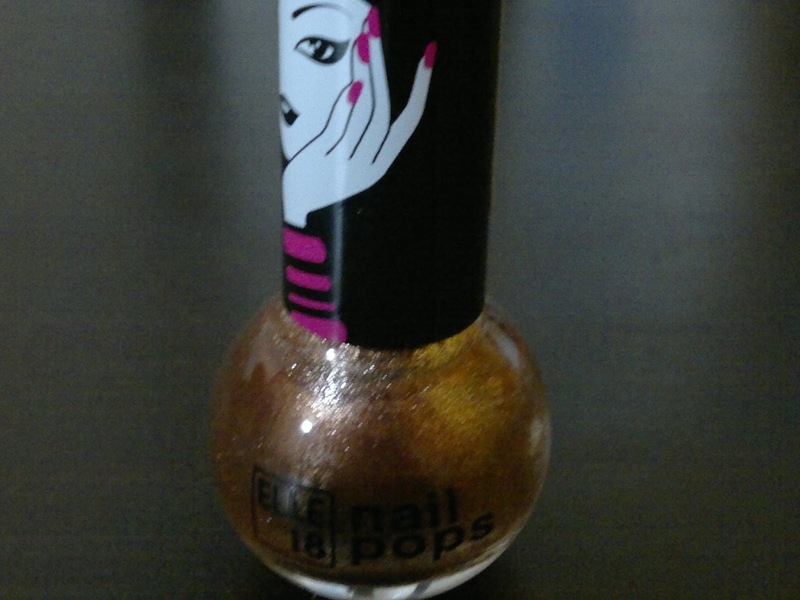 The shade though looks pigmented, applies very sheerly on nails. I had to apply almost 2 coats to get the true color on my nails. Drying time for each coat is alo nothing much to write about. 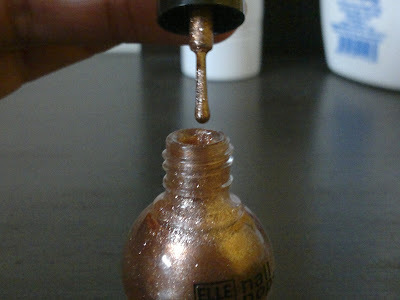 The nail paint takes approximately 5 minutes to dry (first coat) and 10 minutes (second coat). So, in all I had to spend 15 minutes for applying this nail paint, which is quiet okay. It's been three days with this color, there has been slight chipping only.It has not chipped big time. So even though the application was a little time consuming, the end result is quiet good (considering the price tag). I have many nail polishes expensive than this one, which start chipping the next day itself. Nevertheless, it's a great buy for people on budget as well as for those who love to try many shades but get bored pretty easily. 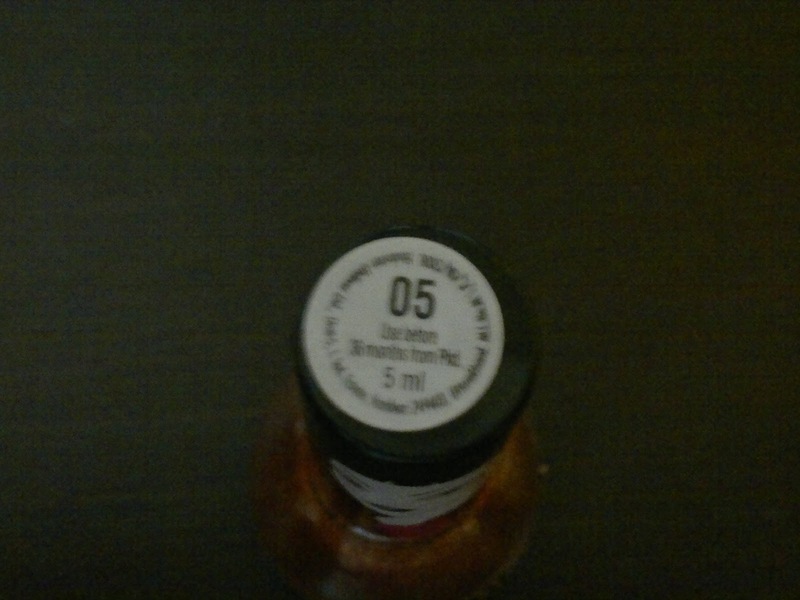 This bottle would last you for 5-6 applications (20 nails). Product rating: B+, available at most online shopping sites and local beauty stores as well.